Most everyone wants to live in a clean, germ free home, but this often involves using highly toxic cleaning products that can be dangerous for children and pets alike. Apple cider vinegar is a simple, acidic liquid made by fermenting alcoholic cider for a second time. During this second fermentation process, the sugars in the alcohol are turned into a range of acids and enzymes that can work as a powerful natural cleaning product around the home. What can I clean with Apple Cider Vinegar? Cleaning greasy pans - The high levels of malic and acetic acid found in raw apple cider vinegar make it perfect for degreasing hard-to-clean pans. Simply add enough ACV to cover the bottom of the pan and allow a minimum of an hour for the vinegar to loosen the stuck on grime. After this time, rinse with warm water and the grease should come away from the pan with ease. Laundry Conditioner - This is one of the most popular uses for apple cider vinegar around the home. Add a cup full of apple cider vinegar in place of your normal laundry conditioner. The natural acids in the vinegar help to soften our clothes and leave them smelling great. Try it and feel the difference! Remove Unwanted Odours - No one likes a nasty, unpleasant smell every time they open the refrigerator door. A simple and easy trick to resolve this issue is to add a cupful of apple cider vinegar to your fridge in an area it won't get knocked over. Dishwasher - Another great cleaning use of apple cider vinegar is the way it can be used to remove food residue and soap scum in dishwashers. This will result in both cleaner dishes and the extension of your dishwashers life. Cleaning Gold - Whether your gold is in the form of old coins, jewellery or any other shape , apple cider vinegar will have it shining like never before. Simply place your gold item in a glass of apple cider vinegar for 20 minutes before wiping clean with a microfibre cloth. Mildew - Mildew grows both on our fruits and vegetables as well as wooden surfaces in the garden. The powerful anti-fungal properties of apple cider vinegar can help in both cases. For fruits and vegetables, a great way to stop mildew appearing is to give them a wash in apple cider vinegar and water before storing them in the fridge or pantry. Not only will this dramatically increase their shelf life, but also remove any chemicals or pesticides that may have been used on your produce. Apple cider vinegar can also be sprayed onto external wooden surfaces to deter the formation of mildew and moulds. Fruit Flies - Although this isn't strictly a cleaning tip, it is one of the most inventive and undisputedly effective ways to use apple cider vinegar. No one likes fruit flies; they swoop and hover at face height and can be extremely unhygienic in the kitchen. Simply put apple cider vinegar in a container, making some holes in the lid with a screwdriver. The flies are attracted by the pungent smell of ACV and, once inside, can not escape. Mwahahaha! Natural Surface Spray - Want an antibacterial, anti-fungal and antiviral surface spray that is both completely safe and 100% natural? 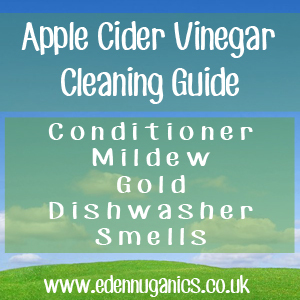 Apple cider vinegar possesses all of these properties and can be easily be mixed with water in a spray bottle for easy application around the home. The first thing you will need is an empty spray bottle. A good idea is to a household plants sprayer as these will never have contained harmful chemicals. The next step is adding apple cider vinegar. It's a good idea to use raw, unfiltered ACV whenever possible. This solution needs to be 1 part ACV to 3 parts water. Once the water and vinegar have been added, you can optionally add a couple of additional ingredients to further boost the fungal fighting power of this spray. Essential oils possess a myriad of disinfectant properties that help to remove germs from around our home as well as adding a lush scented aroma. Be sure to mix in well and always give the bottle a shake before use, as the essential oils like to separate from the mixture if left to their own devices. That's it! A simple yet effective spray for use throughout the home. Keeping your children and pets free from bacteria, germs and any other nasties, while using no chemicals whatsoever! This Stuff Will Make You Want To Clean Your Home's Surfaces!